Introduction: Moyamoya disease (MD) is a disorder caused by blocked arteries at the base of the brain. As the normal blood vessels narrow and become blocked, a person may suffer a stroke. The MD mainly affects children, although adults may have the condition. This is a rare condition, with a marked prevalence gradient between Asian countries. Case Presentation: We report a 5-year-old boy, who was presented with sudden right hand monoparesis and dysarthria. Conclusions: The patient was investigated with magnetic resonance angiography and diagnosed as MD. Moyamoya disease (MD) is a chronic nonatherosclerotic, noninflammatory occlusive intracranial vasculopathy, characterized by progressive stenosis to occlusion at the apices of the intracranial internal carotid arteries, including the proximal anterior cerebral arteries and middle cerebral arteries. It has been associated with 6% of childhood strokes. This stenosis occurs simultaneously, as pathognomonic arterial collateral vessels develop, at the Willis’ circle (1). The MD has a bimodal age distribution, with peaks in the first and fourth decades of life. Adult MD patients often manifest with intracerebral hemorrhage, leading to rapid diagnosis. In contrast, children usually present with transient ischemic attacks (TIAs) or ischemic strokes, which may prove more difficult to diagnose because of these children’s inadequate verbal and other motor skills, leading to delayed diagnosis of the underlying moyamoya syndrome. The TIAs may be precipitated by events common in children, such as hyperventilation, crying or playing (1-3). A 5-year-old boy got admitted in our hospital, with sudden weakness of right hand and dysarthria. He had a history of headache and common cold symptoms, one week ago. He did not have any significant past and family history. General physical examination did not reveal any abnormality like neurocutaneous markers and facial dysmorphism. His blood pressure was 110/70 mmHg, pulse rate was 100 beats per minute and temperature was 36.5°C. On central nervous system examination, he was conscious and oriented and the cranial nerves and papillary examination were within normal limit, except for mild right facial paresis (central type). The motor examination revealed monoparesis in right arm (muscle force: 3/5). This patient did not reveal any meningeal signs at admission. The brain magnetic resonance imaging (MRI) (Figure 1) and brain magnetic resonance angiography (MRA) (Figure 2) are presented in below. 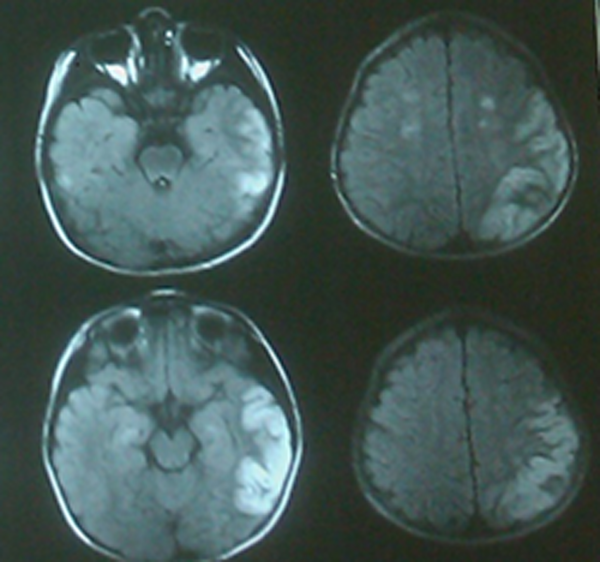 The MD should be considered in any child who presents with symptoms of cerebral ischemia (e.g. a TIA manifesting as episodes of motor dysfunction, speech disturbance, sensory impairment, movement disorders and/or visual disturbance), especially if the symptoms are precipitated by physical exertion, hyperventilation, or crying. Headache is a common presenting symptom in children with MD (1). Brain CT and/or MRI are useful for the detection of brain ischemia and hemorrhage, in patients with MD. 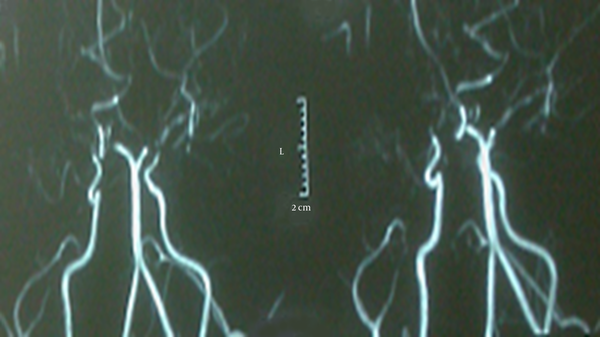 Vascular imaging with MRA, computed tomography angiography or conventional catheter angiography is essential to demonstrate stenotic or occlusive lesions in the distal internal carotid arteries and the arteries around the circle of Willis. Transcranial doppler ultrasonography provides a noninvasive alternative to evaluate intracranial hemodynamics and large artery stenosis (4-8). For children and adults with MD and acute stroke, symptomatic treatments are aimed at reducing elevated intracranial pressure, improving cerebral blood flow and controlling seizures. In cases with hemorrhagic stroke, ventricular drainage is often required. Because of the risk of hemorrhage in areas of extensive moyamoya collateral vessels, many experts are reluctant to use thrombolytic therapy to treat acute ischemic stroke, in patients with MD. Guidelines from the American college of chest physicians suggest aspirin over no treatment, as initial therapy for children with acute ischemic stroke, secondary to MD (9-11). In patients with moyamoya syndrome, it is also important to search for the underlying condition. The main example is sickle cell disease, where transfusion therapy is effective in primary and secondary stroke prevention. Antiplatelet agents, usually aspirin, have been used to treat several patients with MD, particularly those who are asymptomatic or have mild symptoms. Oral anticoagulants are seldom used in children with ischemic MD because of the risk of hemorrhage after incidental trauma and because of the difficulty in maintaining therapeutic levels (12). In adults, hemorrhage is the predominant manifestation of MD and anticoagulation is generally not indicated (4). The other class of drugs that has been useful in the treatment of certain symptoms in moyamoya syndrome is represented by calcium channel blockers. These drugs may be particularly useful in ameliorating symptoms of intractable headaches or migraines, commonly seen in moyamoya patients, and also seems to be effective in reducing both the frequency and severity of refractory TIA (13). Surgical procedures are used most often for patients with ischemic-type MD, who have cognitive decline or progressive symptoms (14). Surgical techniques can be divided into direct and indirect revascularization procedures and their combinations. During hospitalization, the following management procedures are recommended in children: precautions to minimize crying and hyperventilation, pain control measures, avoidance of hypotension, hypovolemia, hyperthermia, hypocarbia and administration of supplemental oxygen (4, 15). The authors would like to thank the English language consultants of the Research Development Center of Sina hospital, for their technical assistance. Authors’ Contributions: Ali Asghar Okhovat developed the original idea, the protocol, abstracted, wrote the manuscript and is guarantor. Roksana Moeini contributed to the development of the protocol and prepared the manuscript.